Huntley’s Hounds was created to give your animals the finest attention, love and care whenever you need to be away from them. We tend to your pets like they are the most precious beings in our charge; we love them as we do our own. Whether it is for an hour or days, with my 19 years local professional pet care experience, you can rest assured that your animals are in the most capable hands. We don’t just walk your dog, and we don’t just house sit. We are there to love all your animals, play with them, entertain them, protect them, comfort them and exercise them. When you can’t be there – we are. 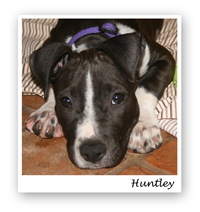 All those associated with Huntley’s Hounds are bonded and insured thru Pet Sitters Associates, LLC; as always your pets and your home are well protected with us.